Our Skippers have extensive experience operating as Captains of large and small sailing boats for more than ten years. Their knowledge of the sailing boats and the weather conditions ensure a perfect and mostly important safe dream trip. Their role is to perform great customer service, act with integrity at all times and keep you safe. They are all calm and able to work under pressure. They are absolutely in charge of your sailing boat whilst on charter and assume the responsibility for the safety and well being of the clients and crew. At no time are they expected to compromise safety in order to satisfy customer desires, expectations or needs, ie sailing under dangerous weather conditions. Our Skippers are to ensure that at all times your sailing boat is in a safe and seaworthy condition and ready to go. They are at all times required to observe and operate within the laws and regulations in force on Greek maritime. Most importantly our skippers are at all times required to be of a pleasant and helpful disposition and in doing so ensure an atmosphere of warm hospitality on board. This in turn leads to happy and satisfied clients. A 40 years old experienced Skipper on Sailing Yachts, has been skippering for more than 10 years Sailing in Greece. Sailing Yachts include both Catamarans and Monohulls from 34' to 65'. He has extensive experience in Offshore Sailing in Greece and has participated in the most famous sailing races in the Greek territory. He knows how to navigate with, but most importantly, WITHOUT electronic navigational instruments (i.e. Plotter, GPS). You can hire him for Day Trips or up to 3 weeks long trip. He speaks English. 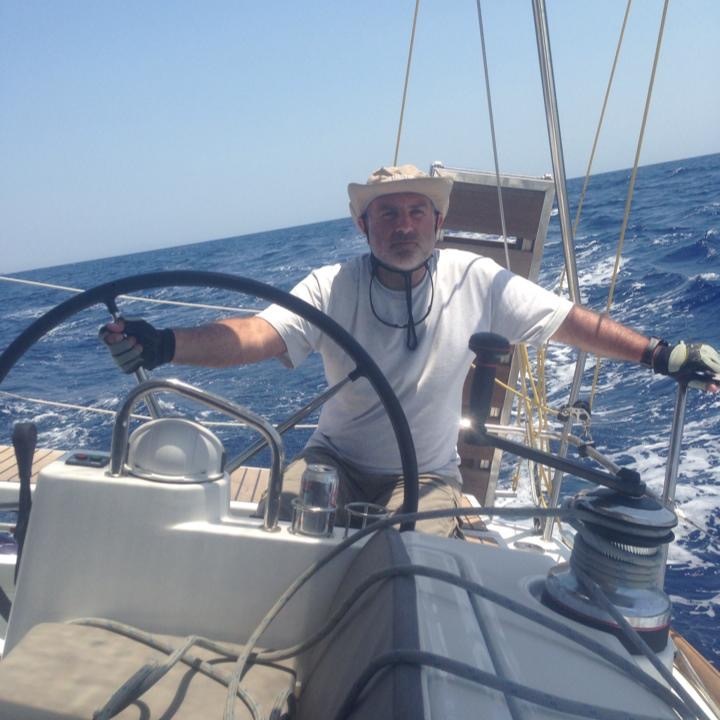 A 50 years old experienced Skipper on Sailing Yachts, has been skippering for more than 20 years sailing in Greece. Sailing Yachts include both Catamarans and Monohulls from 34' to 65'. He has extensive experience in Offshore Sailing in Greece and has participated in the most famous sailing races in the Greek territory. He knows how to navigate with, but most importantly, WITHOUT electronic navigational instruments (i.e. Plotter, GPS). You can hire him for Day Trips or up to 3 weeks long trip. He speaks English.